Blog | How's My Feedback? If you have five seconds, you could do us a big favour and vote for us in the EngageU awards. This is a new “European Competition for Best Innovations in University Outreach and Public Engagement”. Just go to our submission and click on the red box in the top right corner. And while you’re there, have a look at the other projects, too. There is some really good stuff going on. The British hospitality industry is under attack. Businesses are being assaulted by ever-more nit-picking and abusive reviews. It’s bad for their livelihoods and their sanity. But it’s not the professional critics who are reviewing their hosts; a nation of virtual AA Gills and Michael Winners are using the Trip Advisor website to get their own back on hotels and restaurants. 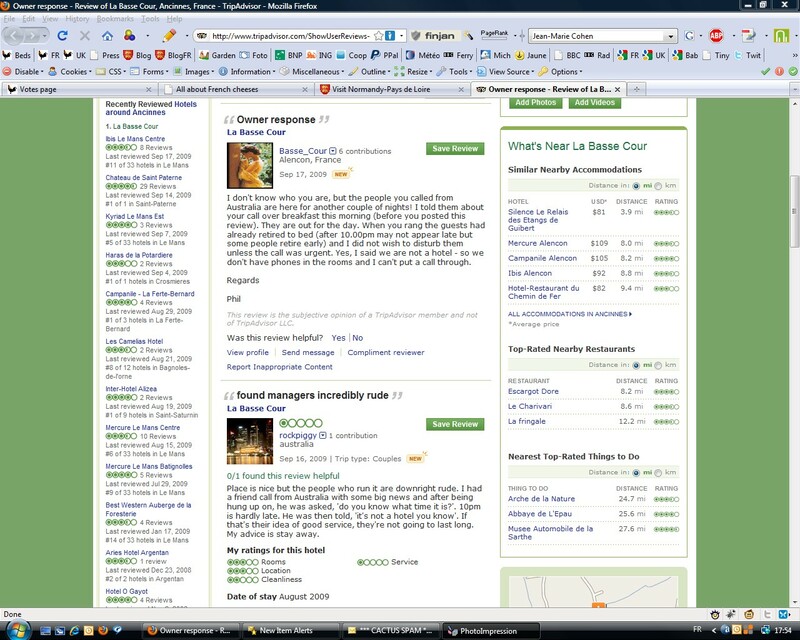 With more than 40 million users a month, Trip Advisor is the largest and most powerful travel guide in the world. But is it a force for good that gives the customer a voice, or an abuse of power that undermines businesses and ruins lives? How long can Britain’s small businesses cope with relentless criticism before they pack it all in? This Cutting Edge film reveals Britain’s most meticulous Trip Advisors and meets some of the hoteliers and restaurateurs at war with the site. The documentary features some interesting cases and highlights many of the issues we have been dealing with in the How’s My Feedback? project. Not surprisingly, the debate has already started in the TripAdvisor section. Opinions and experiences differ wildly, so please join in and share your story. The issues clearly go beyond TripAdvisor, but it is a good case in point to discuss some timely and important problems around online reviews, ratings and rankings. If you missed the show, you can still watch it here at Channel 4OD. Thank you very much to everyone who made yesterday’s conference a success. The day was packed with discussions, provocations, insight and — who would have thought — feedback. All sessions were recorded so we will post the videos soon. For the moment, please find below a collection of snapshots and comments. At the heart of the conference were five talks, which offered different perspectives on the phenomenon of online reviews, ratings and rankings. After a brief introduction by Steve Woolgar and myself, Stefan Schwarzkopf drew some interesting connections between his attempts to review a hotel and ideas from political theory: “Feedback, democracy and conflicting consumption in a New York hotel: A journey from theory to micro-study, and back”. His presentation was followed by remarks from Daniel Neyland, who challenged the idea of a preexisting object of evaluation and shared a story about his own struggles with a review of a recent book of his. Next, Alex Wilkie from Goldsmiths reported on his research about “User involvement in design” and specifically the role of personas and user assemblages in the design process. In his comments, Tim Webmoor reflected on Danah Boyd’s Twitter debacle and the changing conception of the expert in evaluations. After the lunch break, Andy Balmer reinvigorated the audience with an autoethnographic account of “Being 6.1: My life on HotorNot.com”, followed by Sally Wyatt’s remarks and provocations, which were partially delivered in the form of a t-shirt. Finally, Malcolm Ashmore reflected on the notion of reflexivity in his talk “What is it to evaluate the evaluators? A fairly formal reflexive analysis”, to which Javier Lezaun responded with some (in his own words) “unfairly informal” comments. Christine Hine and James Munro skillfully summed up the day and offered concluding remarks, including individual ratings of speakers on a 10-point scale as well as an analysis of the speaker hotel and it’s mixed reviews. The list of delegates was long and diverse. Besides academics, also practitioners came to Oxford, including Amazon reviewers, university administrators and social entrepreneurs from organizations like How’s My Driving Ltd, GAF Materials Corporation, MMU business school, VU University, Patient Opinion, IE Business School, BestSoftwareIndex.com, Bazaarvoice, BPP University College, ECI, London Business School, Arizona State University, University of Cambridge, University of Bedford, Research in Practice, Infosys Technologies, aporia, University of Tasmania, University of Reading, Scientific Council for Government Policy, University of Lincoln, New York University, HealthUnlocked, University of Kent, Manchester Metropolitan University, University of Leeds, UNED National Distance University of Spain, University of Leicester, The Open University, Imperial College, GHK Consulting Limited, and the London School Of Economics. In order to get a better sense of the dynamics of evaluation, we engaged in a live experiment, using the latest development in feedback technology. 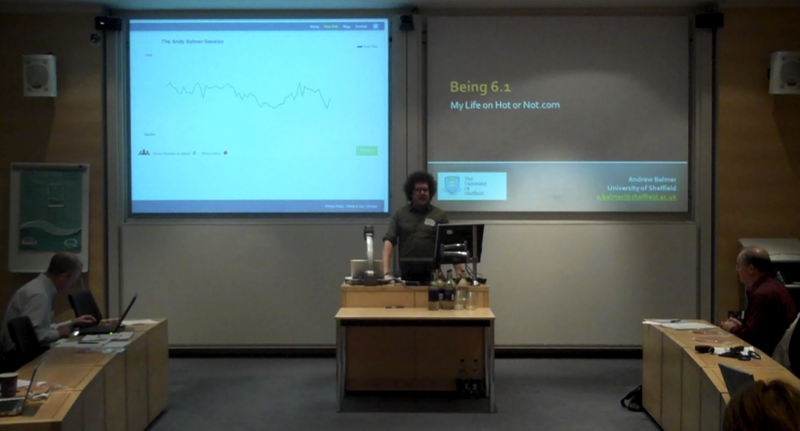 Andy Balmer generously volunteered (and actually was quite keen) to participate in a real-time worm poll. 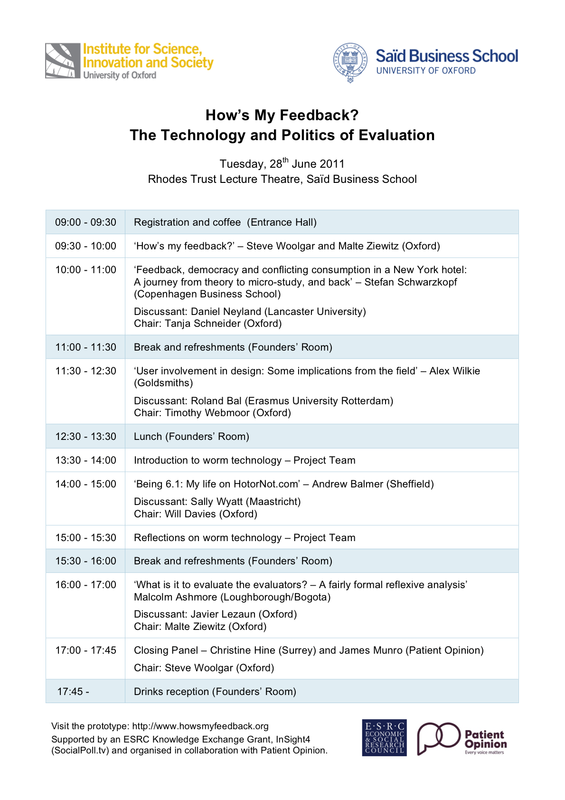 Members of the audience could indicate whether they “Liked” or “Disliked” Andy’s talk at any time during the session. The individual votes were then aggregated into an evolving worm graph, displayed next to the speaker’s slides. The worm experiment offered an excellent opportunity to experience and reflect on what it is to be evaluated as well as to evaluate. In a discussion after the session, participants shared their observations about the effort required to focus on both the talk and the worm, ethical concerns and uneasiness in anonymously judging the speaker, technical difficulties of accessing the school’s Wi-fi, the discussions among the project team about the temporal-spatial arrangement of screens, speaker slides and audience before the conference, as well as moments of gaming when participants chased each others’ movements up or down. While the worm poll may not become a standard feature in academic talks, the experiment generated some challenging questions, which would have otherwise gone unnoticed. A special thank you is due to the outstanding developers and designers at Insight 4 Labs, who made the experiment possible. A beta version of the technology is now available for public use. So if you are interested in trying it out, have look at SocialPoll.tv. It is great fun to play with and you will certainly come up with novel applications such as voting on live TV shows. 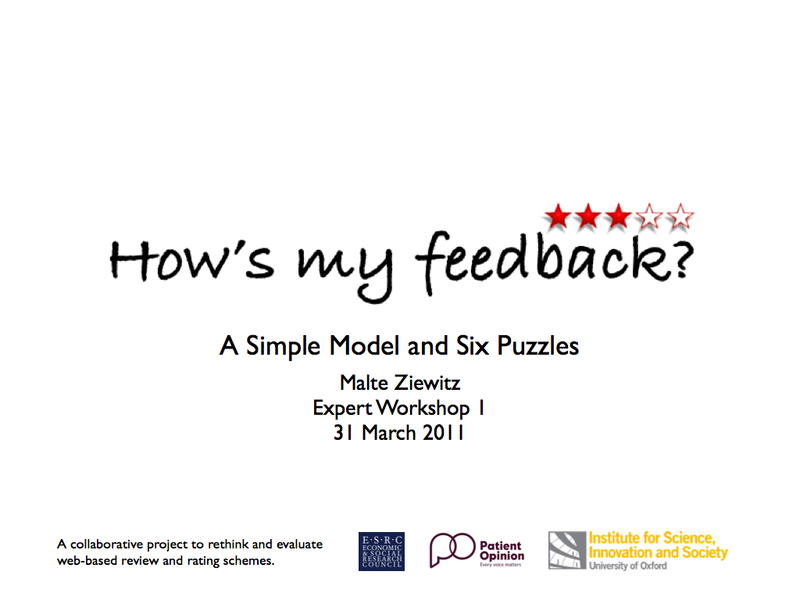 @AuntieHelen “All feedback is rubbish and leads to prostitution and bad book reviews.” Daniel Neyland. A good discussion point! Many thanks to the ESRC, the Institute for Science, Innovation and Society and our project partner Patient Opinion for their generous and ongoing support. Project update: What’s new in May? As you might have noticed, the announcement for the one-day conference on 28 June is out. We have a stellar line-up of speakers, including Malcom Ashmore, Andrew Balmer, Alex Wilkie, Ian Stronach and Stefan Schwarzkopf. 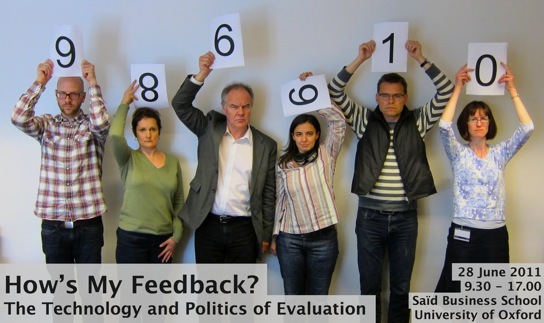 While they all come from academic backgrounds, they promise to give some interesting (and, I have been told, entertaining) feedback on the project and issues of online evaluation more generally. If you would like to participate, please register soon. The event is free, but places are limited. We also have been around a bit to talk about the project. Two occasions have been particularly interesting. On 19 April 2011, I participated in a panel discussion at the Internet Freedom Conference in Strasbourg organised by the Council of Europe. ‘Multistakeholderism’ is a popular idea in this context, and the group was particularly interested in the potential of web-based reviews and ratings for fostering participation and engagement in policy-making. The video of Panel 6 is still online. On a very different occasion, I presented the project at the Harvard-MIT-Yale Cyberscholar Working Group at the MIT Media Lab. This was a great opportunity to get feedback from a very diverse crowd of people, including media designers, HCI researchers, lawyers and social scientists. There was also a second presentation by Nick Bramble, which very nicely highlighted the important legal issue of third-party liability for content posted on review and rating websites. Of course, we have also been working on the prototype. It has been far from easy, given the shoestring budget and tight timeframe we are on. However, while things are moving slowly, they are moving and we hope to have something to tinker with soon. If you think you can contribute anything to the process from design skills to a developer brain, it’s not too late. Finally, a lot of people got in touch and offered their support or simply showed interest in the project. In this context, have a look at other initiatives, such as Eric Goldman’s and Jason Schultz’s new project Doctored Reviews that aims to help people deal with restrictions on online patient reviews. More updates soon. Again, don’t forget to register for the conference.